I absolutely adore children's theatre. There is something so magical about captivating a younger audience and the brand new show Billionaire Boy is no exception. Based on the well loved book by David Walliams, this musical is high energy and perfect for every member of the family. It was certainly a night that we won't be forgetting in a hurry! The story opens with us meeting Joe Spud, a boy who's been shot to the highest heights as a billionaire thanks to his dad's newest invention. For his dad has created the best toilet paper known to mankind, toilet paper that even the queen endorses and now they have everything they want. But really all Joe wants is a bit of anonymity as he starts a new school. He wants to make friends on the merit of himself as opposed to his fame and fortune. Of course his secret isn't safe for long and the show follows the ups and downs of Joe and his friends and family and they muddle their way through life. It's worth pointing out that this is a musical as opposed to a play. 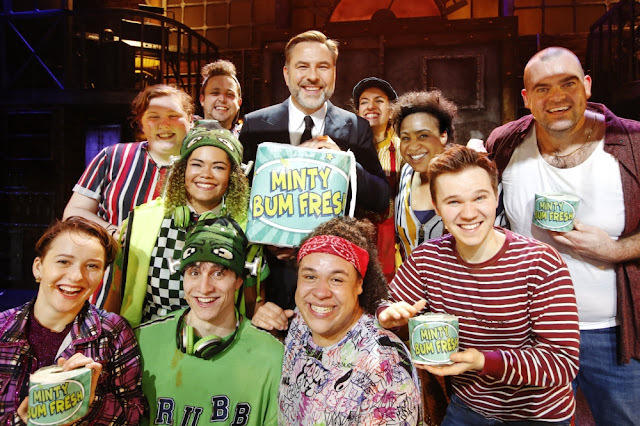 Previously, all of the works of David Walliams that have been adapted have all been plays aimed at families. This on the other hand is a brand new musical full of original songs aimed at families and I am all for it. As everyone that reads here regularly knows, musicals are something that I adore and as soon as I listened to the opening song, I was completely won over. This is a work of genius. The story itself follows as close to the book as can be and features all the familiar faces that fans of Walliams will know and love, but also introduces them in a way that is accessible to everyone. So don't worry if you haven't read the book or seen the short film, you aren't missing out on any hidden secrets! Whilst Max has seen the film and read the book, I went into the show not knowing anything but I absolutely loved it. The cast themselves were fantastic. From playing several roles that had everyone in stitches, to keeping everyone entertained, and even singing along by the end of it. It was non stop and full of so much energy that even Red Bull and the Duracell bunny would have been jealous. I absolutely loved Dean Nolan who played not only Joe's Dad but also the school cook, And Lem Knights playing Joe's best friend Bob honestly had everyone falling in love with his character. The whole cast are just so good, that you can't help but love each and every part of the show. Whilst this review might be quite vague, it's because I don't want to give away too man plot points of aspects to the story that might spoil it for others. it isn't a show that is in it's tenth year, merely one so far in it's infancy that many have yet to even see it's on their radar, let alone watch it. All in all this show was a perfect show for the whole family to love and enjoy. It was one that blew me away with not only the cast, but also the songs and the show itself. It's heading on tour for 2019 and I honestly urge each and every one of you to take your family to enjoy it. You won't be disappointed as it's got everything you want!